The Dallas American Airlines Arena and California Speedway: what do these hot spots have in common? They were all built as part of brownfields property renovations. Brownfields redevelopment has been the buzz in the political, property development and environmental consultant markets during the past several years. From the consultant who sees the challenge of solving an environmental problem to the politician seeking to increase tax bases, to the developer who sees a need in a particular area of town, brownfields have made their way to the forefront of our dynamic culture. In case you have missed the accelerated advancement of the brownfields movement, let's digress for a moment. The first brownfields bill was introduced in the U.S. Congress in 1993. Although the bill failed to pass, it did provide the first legal definition of a brownfields property: "abandoned, idled, or under-used industrial and commercial facilities where expansion or redevelopment is complicated by real or perceived environmental contamination." Businesses or individuals are now protected from federal liability if they can prove that they did not contribute a significant amount of nonhazardous waste to the site and did not add any hazardous waste during their ownership or usage. On January 25, 1995, U.S. Environmental Protection Agency (EPA) Administrator Carol Browner announced the Brownfields Action Agenda, outlining EPA's activities and future plans to help states and communities implement and realize the benefits of the brownfields initiative. The EPA's Brownfields Economic Redevelopment Initiative was designed to empower states, communities and other stakeholders in economic redevelopment to work together in a timely and cooperative manner to prevent, assess, safely clean up and reuse brownfields. This brownfields initiative formed a mechanism that offered site owners financial and technical support via state voluntary cleanup programs. Approximately 42 individual states developed voluntary programs, and hundreds of brownfields sites were remediated in these voluntary programs. In most cases, these programs set higher cleanup standards than were required federally and provided liability protection under state law for new owners and operators of a brownfields site. However, until the first federal brownfields law was enacted in January 2002, which is entitled the "Small Business Liability Relief and Brownfields Revitalization Act" (Public Law 107-118), state programs were hindered by the lack of liability protection provided by federal law, which stated that owners and operators of a contaminated property can be held liable for the cost of cleanup, regardless of whether they actually caused any of the contamination. In addition, state programs were at times hindered by the federal government, which could override decisions of the state programs. As a result, these potential liabilities created a strong deterrent for individuals and businesses to avoid redeveloping brownfields. To combat this problem, the new law had several key provisions. 1). Businesses or individuals are now protected from federal liability if they can prove that they did not contribute a significant amount of nonhazardous waste to the site and did not add any hazardous waste during their ownership or usage. 2). Funding was increased to state and local governments. Two hundred million dollars was provided annually over the following five years to clean and revitalize brownfields properties. 3). States received additional assurances that the federal government would not later override brownfields cleanup decisions under state programs. 4). Protections are afforded to innocent parties, such as the owners of property adjacent to contaminated sites, prospective site purchasers and landowners who did not contribute to the contamination of their property. In addition to these provisions, the new law expanded the legal brownfields definition to include mine-scarred lands and petroleum and controlled substance contamination sites, e.g., former gas stations and narcotic (methamphetamine) labs. EPA was also authorized to offer direct cleanup grants, hold exclusive funds for petroleum contaminations and increase the resources for state and tribal funding. Site owners benefit by avoiding potential environmental enforcement actions by federal, state and local regulatory agencies. Communities benefit by receiving tax benefits for restoring an idle site to the tax base. New jobs are created and goodwill comes when an "eye sore" is eliminated. Environment benefits from a reduction in on-site and potential off-site contamination. Corporations benefits by eliminating the site as a liability on financial statements. Investors benefit by realizing an enhanced return from a property that was made more valuable. Even still, multiple sites are yet to be addressed. In spite of success stories and the federal government's initiative to foster the brownfields movement, brownfields redevelopment remains hindered primarily by three obstacles: cost, reluctant lenders and lack of proper planning. However, with a little creativity and innovation, these obstacles can be overcome. A brownfields redevelopment project is nothing more than a development project with one twist -- it involves the assessment of environmental issues and action to address discovered environmental problems on a site. For many projects, the cost of an environmental assessment is easily controlled or negated by obtaining readily available grants from state and federal sources. Depending on the site, this assessment may include the collection of soil and groundwater samples, asbestos and lead paint surveys, abandoned waste profiling and assessment of other potential environmental liabilities. The "deal killer" is usually met when the findings of the environmental evaluation present a need for site remediation, since available grant money for site remediation falls short of demand, or when site remediation presents the possibility of project overruns. One resource to consider when facing this situation is insurance. A good place to start when faced with the challenge of paying for a costly site remediation is to look at the historic general liability policies that would have been purchased by the site owner. These are typically discovered during an insurance archaeology analysis and can provide millions of dollars to pay for site remediation. It has been well established in court that these historic policies do not expire and are applicable even to sites that have been abandoned for many years. Even if a brownfields redevelopment project is budgeted to include environmental remediation costs, there is a potential for costs to grow and a potential for third party liability claims from surrounding property owners. To protect one's self from these financial liabilities, a clean-up cost cap policy and pollution liability policy can be purchased from many national insurance companies. Clean-up cost cap insurance policies protect owners against cost overruns that arise in the course of a planned remediation on a brownfields site. Coverage may be provided to cover costs associated with discovery of a larger problem during remediation efforts, costs due the to discovery of contaminants not initially discovered and costs due to regulatory changes and legal defense costs associated with the unanticipated remediation. The risks covered by pollution liability policies provide protection against the costs of third-party bodily injury and property damage claims that occur on-site or off-site and associated legal defense costs. Since remediation costs are often hard to calculate and can add substantially to the overall development cost, many investors are reluctant to finance redevelopment projects with contamination problems. The Comprehensive Guide to Redeveloping Contaminated Property, put together by the American Bar Association, cites that lenders have two types of concerns when it comes to lending money to a brownfields project. 1) Lenders are concerned about estimating and retaining the value of the contaminated property held as collateral; and 2) Lenders are concerned about the potential of being deemed owner or operator of a site and becoming liable for the environmental issues at a site. The passage of the first federal brownfields law in January 2002 has helped to ease concerns that a lender could be liable for remediation; however, there still remains concerns regarding the potential financial implications of lending on a site that is worth less than what has been borrowed. The new law expanded the legal brownfields definition to include mine-scarred lands and petroleum and controlled substance contamination sites, e.g., former gas stations and narcotic (methamphetamine) labs. One can again turn to insurance as a possible solution to ease lender concerns. Obtaining secured creditor policies can provide a mechanism for reimbursement of loan payments and compensation for lost collateral to lenders. In addition to insurance protection, lenders benefit when the borrower can provide detailed information regarding the environmental conditions of the site. 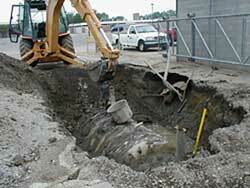 This information can be obtained during the site investigation phase. As a borrower (or lender), it is important to hire an experienced environmental consultant who will take a scientific approach to investigating the site. If done correctly, cost estimates for remediation can be obtained that assist with evaluating the true market value of the property. Representatives from the affected community. Evaluation of available funds to support the project. As has been shown, the brownfields movement has rapidly progressed during the past several years. Several communities have utilized available grant money and have taken advantage of the protection provided under new legislation. If you would like additional information on brownfields projects or how to obtain brownfields grant money, contact your local government agency.